That time between Christmas and the New Year gives us a moment of reflection. We think about what has happened over 2017 yet also look forward to what 2018 has in store. So much of how our lives have changed in the past year greatly affect how we move forward in the year ahead. The Christian life is lived in the same way. To move forward in the Christian faith, we often need to spend more time looking back at what God has already accomplished for our sake in the past. With that in mind, I offer three areas of prayer we should all desire for 2018. Our culture has shifted where we only care about how much we store in our heads. There has been less focus on how what we know should change how we live. We often approach spiritual living in the same way. We wonder if there's more to the good news of the gospel, as if there's some greater spiritual plane we need to ascend to, some secret knowledge we still need to attain in order to have real breakthrough with Jesus. Yet when Paul prays in v.9 that believers would be "filled with the knowledge of his will," he's not asking God to give the Colossians more enlightenment than what they already know. He's praying they would root themselves deeper in what God has already revealed to them in His Word, the gospel of Jesus Christ. To know God better, know Christ more. To go deeper in faith, know the gospel well. The hope of the gospel is that we would be transformed and changed to be more like Christ. This isn't easy but God has empowered us so this change might be possible. Paul prays in v.11 that believers would "be strengthened with all power, according to his glorious might." This is the same language used in Isaiah 11:2, where it is the Holy Spirit that empowers God's people. The reality is that the person who finds the Christian life boring or passionless simply does not understand the power at work in them by the Spirit. We need to cede control, surrender to Christ, submit to His rule and let God's power work in us by His Word, His people, and prayer. Paul gives us ample reason to be thankful to God. He specifies three things in v.12-13: we are qualified for a spiritual inheritance, transferred from darkness to light, and redeemed and forgiven of our sins. It's hard to be thankful when we don't know what we're being thankful for. The truth is a lack of thankfulness to God in our faith often is connected with living out of a perceived spiritual poverty instead of apprehending the riches of our spiritual treasure in Christ. When we live as if God still owes us something or that the gospel is missing something, we will not praise but complain. True thankfulness rises only when we've taken hold of all that Jesus has won for us at the cross and in His resurrection. 1. As you look back at 2017, what did you learn or experience that you plan on carrying with you into 2018? 2. How do you want to know God better this year?What do you think it looks like to go deeper into the gospel this year? 3. Have there been seasons in your faith where you've felt apathetic, passionless, or bored? Why do you think that is? 4. What does it look like to be empowered by the Spirit? How would that change the way you currently live and think? What are the ways in which the Spirit is already at work in your life? 5. Are there ways in which you feel a spiritual poverty in your faith, as if God hasn't provided enough in the gospel? Why? 6. How does reflecting, meditating, and trusting in the promises of what Christ has won for us at the cross make us more thankful to God? How might you grow in thankfulness to God in this year? 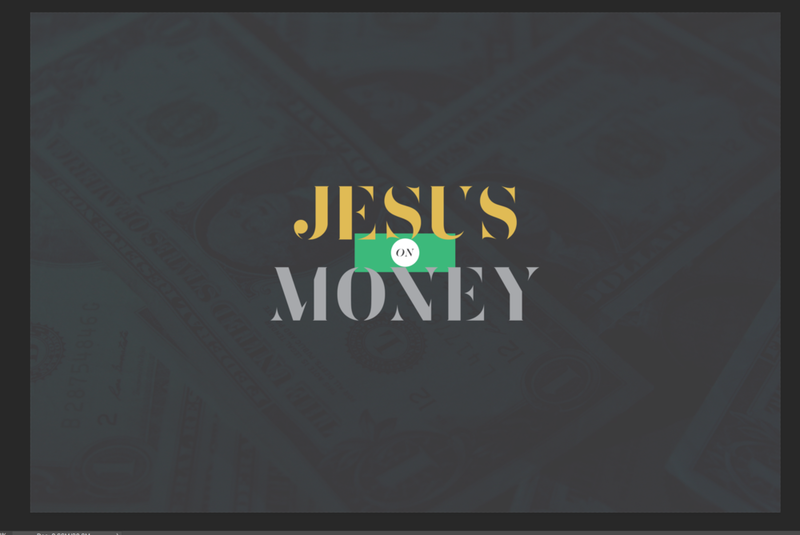 This is a recap of the latest sermon in our series on Jesus on Money. We live in a culture where a premium is placed on security. The question we need to ask ourselves though is what exactly are we securing? What do we think we can guarantee for the future? What we see is true security is only found in giving up control to the God who is in control of everything and secures our future by His Son, Jesus. In v.13-15, Jesus’ rebukes the interloper for covetousness, which clearly was connected to a desire for security. He was more concerned with his financial future rather than his eternal future. Reality is that most of our efforts with earthly security aren’t all that secure. If anything, our search for peace of mind only brings us more worries. Jesus’ parable reminds us that there is no form of earthly security that can rescue us from death. Just as we are with money, the more security we have, the more security we need. Our sense of security is all-consuming and relentless. The parable shows that the rich fool is not satisfied with what he has but only sought to make space for more. Ultimately, my definition of what is the right amount of security to have in life is purely subjective and never truly secure. By every worldly standard, Jesus was the least secure person in the world, with no home, no wealth, no influence. He gave all this up so we might be recipients of God’s love and protection. Gospel tells us it is acknowledging our inability to secure and protect ourselves that God meets us with Christ and his care. We know we are spiritually secure when we think more about what we can give rather than save, are self-forgetful rather than self-protective, and are no longer worry about our security. In what ways have you tried to secure for yourself and your family a good future? How much control do you think you have over your own safety and security? Do you ever think you fight God for this? Is there a point where you think a person has saved too much for the future? What is it? How does our sense of security become a form of self-righteousness before God? How does it affect our attitude toward others? How does it reveal our own insecurities? In what ways was Jesus the least secure person ever? Why did he choose to live this way? Are there ways in which you see your own heart changing as you’ve grown in trusting your safety to God in your own spiritual life? How might placing your security in His hands change your life now? Whether you realize it or not, everybody is a worshiper. Everyone is devoted and has reverence and adoration for something. There is always something that demands all your time, thoughts, energy, emotion, and money to. In most cases, what we own, we end up worshiping. Since we are owners of God’s grace in Christ, we worship Him by being faithful stewards of what we’ve been given. Whatever it is we worship will always be all-consuming and place demands on you. The reality is what we own always ends up owning us. This isn’t just talking about children, houses, or jobs but even how we possess ideas like freedom or choice. These are not bad things in and of themselves but they easily consume us. This is why there is freedom in reality that God doesn’t call us to be owners but stewards of all He has given. In the parable, the dishonest manager realizes his previous failures in stewardship and makes decisions to protect his future. The reality of stewardship is you can’t do whatever you want with what you’re given. You’re always subject to the one who gave you the responsibility. In the same way, God has called us to be stewards of what all we have and act with God’s desires in mind. Furthermore, Jesus’ parable helps us see that if non-believers are wise enough to invest with their long-term futures in mind, how much more should followers of Jesus take what is earthly and invest it in eternal things? Especially since Jesus is the only thing we ever truly own, how much more should all we have, spend, give, and do be directed toward His ends? Jesus is the only thing in this world that we worship that will not demand or eat us alive. He is worthy of our worship. What are the things in your life that you feel a strong sense of ownership of? What are the things that you know you are only a steward of? Have you ever owned something that really ended up owning you? That ended up sucking up your time, money, or energy? How does seeing yourself as a steward rather than an owner of your money change the way you think about and handle it? Are there ways in which you are actively seeking to take what is earthly and temporal and investing it in eternal and everlasting things? How? How does the reality that the only thing God calls you to truly own and take hold of is Jesus Christ Himself? How does that change the way you approach your possessions? How does worship of Jesus differ from worshiping any other gods or earthly things? What does Jesus demand from us in return versus what everything else demands from their adherents? In light of what was preached this past Sunday, we wanted to share this poem as a reflection of God's faithfulness. He chases after us even when we've run away, seeking us out even when we try to hide. 'All things betray thee, who betrayest Me'. And silvern chatter the pale ports o' the moon. Drew the bolt of Nature's secrecies. I laughed in the morning's eyes. In vain my tears were wet on Heaven's grey cheek. Naked I wait Thy love's uplifted stroke! His name I know and what his trumpet saith. Of all man's clotted clay the dingiest clot? But just that thou might'st seek it in My arms.